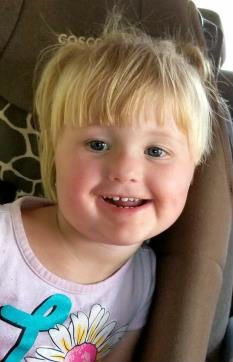 Shayla is a spunky little 3 ½ year old with plenty of energy, despite her physical challenges. Doctors believe that Shayla had a stroke at birth. She had seizures right after she was born and wasn’t developing as she should. At two months old her parents knew something wasn’t right and they began having tests done to find out what was wrong. At nine months old she was diagnosed with cerebral palsy. Shayla can’t stand or balance on her own, so she uses a walker to get around. She has braces on her feet and hands. Her family is hoping she will get a wheelchair in May when they go to Shriner’s Hospital in Portland. Shayla goes to physical therapy, occupational therapy, and speech therapy regularly. She has a very small vocabulary and deals with developmental delays. Shayla loves being outside and scoots everywhere. Her mom has a hard time keeping her clothes clean… but a little dirt and dust don’t seem to bother Shayla! She is super adventurous and loves to explore. She loves playing with her toys, especially her baby dolls. And being a typical kid, she loves watching cartoons. Shayla loves to eat… and like most toddlers, her favorite things are goldfish crackers and pizza. cheerful nature will serve her well as she gets older and shows the world how to live life Shayla-style! Sparrow Cash raised for Shayla will help with ongoing medical expenses and travel to doctor appointments in Portland. Students at Redmond Proficiency Academy will “earn” Sparrow Cash by completing a minimum of 256 hours of sponsored community service.